Community Supported Agriculture is most often denoted by the acronym “CSA” and is a term commonly used to describe a product subscription service from local farms. Funds for orders are prepaid giving farmers the use of funds for planting for the upcoming season. A CSA subscription is a commitment from the consumer to the farmer, thus allowing the farmer to take on the risk of planting and growing. Three Sisters Farm has three CSA subscription types: Flower, Vegetable, and Chef. Click shop to see our current availability! Sign up for a CSA Flower Subscription and each week a large bouquet of fresh from the garden blooms, aromatic herbs, and foliage will be waiting for you at the chosen delivery point. What’s in bloom changes from season to season and week to week, but always unique and beautiful. We offer several options for subscriptions and pick-up locations in Bluffton, Hilton Head, and delivery to the Port Royal Farmers Market. Subscriptions are available for Spring, Early Summer, Late Summer, and Fall. For details and to subscribe check out our shop! Our vegetable CSA brings you the freshest selection of each season on a weekly (10 orders) or bi-weekly (5 orders) basis. Every CSA comes in an insulated cooler bag and will contain a variety of vegetables, herbs, and berries when in season along with a small seasonal flower bunch. All products in our CSA are grown right here on the farm. We NEVER outsource products from other farms or wholesalers. 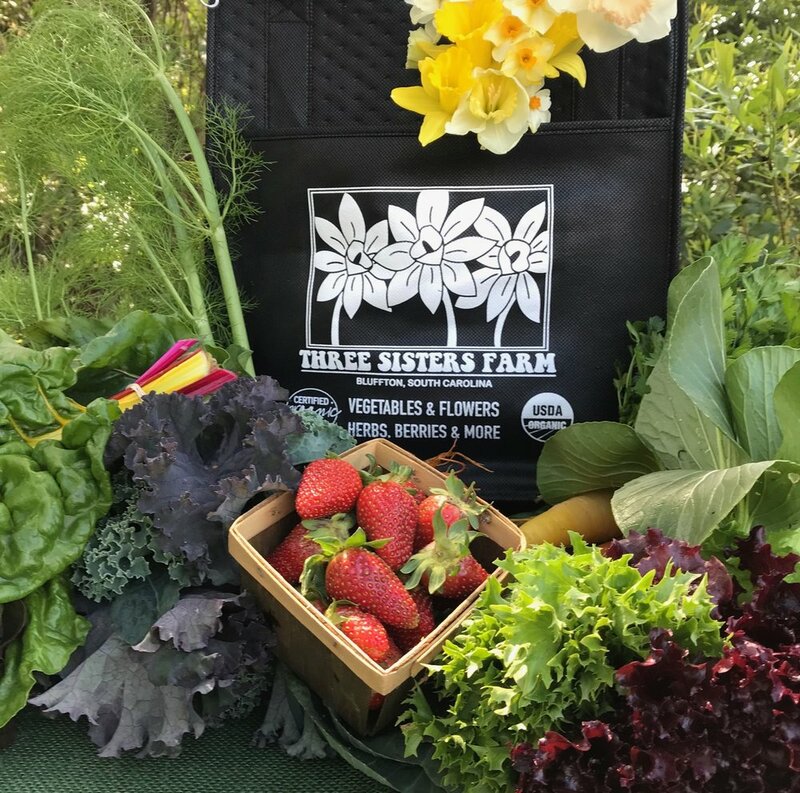 A typical spring bag will contain items such as spinach, lettuce, kale, carrots, fennel, turnips, arugula, parsley, mint, tomatoes, asparagus, parsnips, cilantro, collards, and radishes. Your bag will contain about 8 items and a small flower bunch. Larger bouquets may be added for an additional fee. Eggs from our pastured laying flock may be added. (Our eggs are not certified organic.) Our hens are free range and are housed in mobile housing during the night hours. During the day they are guarded by our devoted Anatolian/Pyrenees shepherds, SoCo and Ginger. Customers have the option of re-scheduling pickups when they are traveling or vacationing. We must be notified a week in advance for pick up changes.